Not really a dark destination as such, but a representatively desolate, provincial town in remote south-east Armenia. It has a couple of mildly dark sights though – and is a good stop-over on the way to Nagorno-Karabakh. More background info: Much of Armenia outside the booming capital Yerevan is not only very provincial but also shows the signs of decay that the collapse of the Soviet Union brought with it and from which places like this haven't yet recovered. Industries and thus jobs are largely gone, and with it the accompanying infrastructure for the people too. 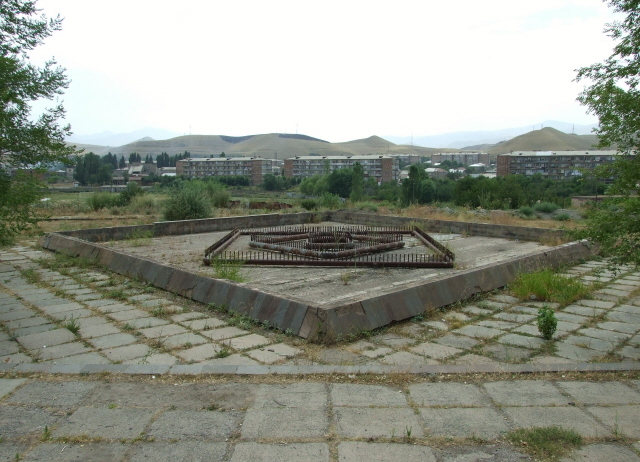 Other small towns and cities in Armenia may show more numerous and more dramatic relics of the industrial wastelands left behind after the Soviet economy fell apart (e.g. 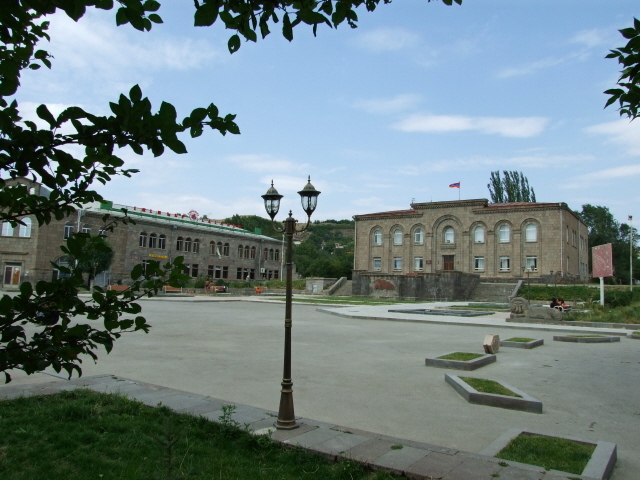 Vanadzor or Alaverdi in the north). But Sisian is typical of the "forgotten" little places in the country that never even had much to begin with. And with collective farming gone, there's really precious little life left in it. Consequently it is hardly "touristy" by any stretch of the imagination. Still, people do come to stay here, even if it is just for the location being conveniently close to some "proper sights" – it's also cheap. For the dark tourist too, the main attraction of Sisian is its location on the only route to Nagorno-Karabakh. 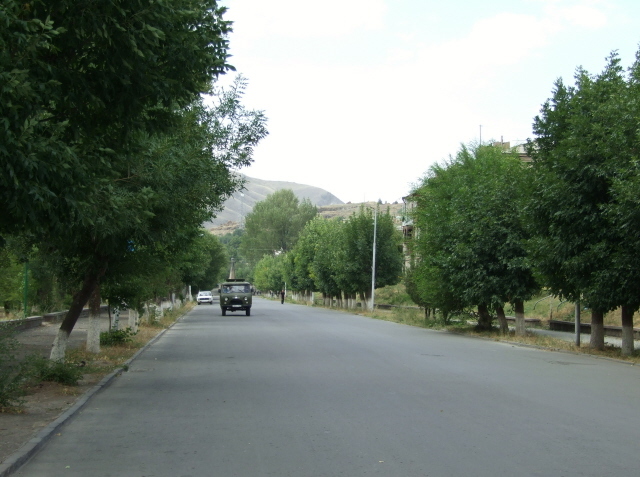 It's not as close to the "border" as Goris, from where the Goris-Stepanakert "highway" constitutes the lifeline road into the ex-enclave through the former Lachin corridor. But Sisian has more of a dark-ish appeal of its own. What there is to see: Not much. It's more about the desperate overall atmosphere of this remote Armenian town than about any specific sights. There are, however, a couple of Soviet-era monuments that are of some note. This is particularly true of the one to the western end of Sisakan Poghots, which is kind-of the main street. 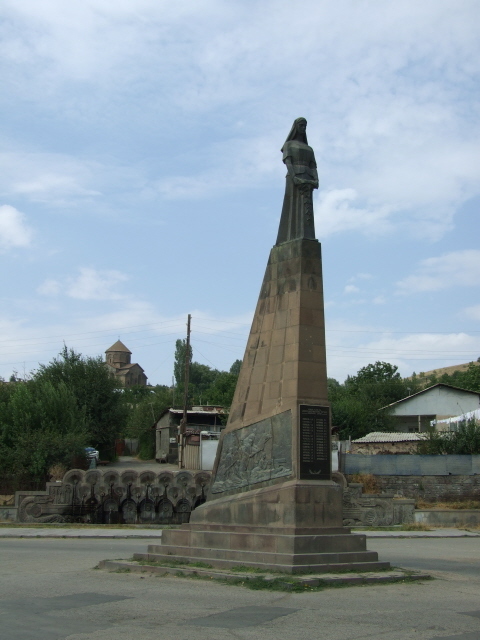 The ensemble with a central obelisk with a stony woman on top is remarkable mostly in that it is a rather un-Armenian (even anti-Armenian) monument, namely one celebrating the early Soviet suppression of the national revolutionary Armenian "Dashnaks". Other than that, dedicated lovers of the derelict could walk down to the river and across the bridge and root around a bit in the town's "funfair" on the opposite bank of the river. I found it to be an almost eerie place. There are some rides left, a couple still even operational, as it seems. But there was absolutely nobody about – still, from the ticket booth of one of the rides loud pop music blared out to the entertainment of … well, nobody. Other ex-rides were just rusting wrecks. The whole atmosphere reminded me a bit of that at the funfair in the ghost town of Pripyat near Chernobyl, only with sound! You could continue with a stroll along the partly overgrown ex-promenade by the river – but watch your step: there are plenty of very deep open manholes ... the covers presumably taken away and sold as scrap many years ago. Other than that, Sisian is mainly a convenient jumping off point (and alternative to Goris) for the onward journey to Nagorno-Karabakh, or, in the other direction, to Yerevan. Location: a few miles south of the main trunk road between Goris, some 20 miles (30 km) further east, and Yerevan, ca. 100 miles (160 km) to the north-west. Access and costs: remote but OK accessibility; cheap. Details: public transport is primarily by marshrutkas (shared minibus taxis), which run from the junction by the bridge, and buses that stop by the turn-off from the main Goris/Yerevan trunk road off the potholed access road to Sisian. Taxis are a real alternative here, though – I found them to be cheaper in this region than in most other places in the Caucasus (or maybe I was just lucky). Accommodation, too, is notably more affordable, including at the town's principal hotel, the Dina ... in fact, to me it seemed to be the only hotel left in business – the plusher Hotel Lalaner right on the town square looked decidedly closed to me. Even Hotel Dina's "lux" junior suites with balconies overlooking the front garden (easily the prettiest spot in the whole town) only cost a fraction more than the bare and basic standard rooms … well worth it for the extra space and amenities. (And also not least for their pronouncedly old-fashioned Soviet-era "charm" – which I for one found lovely! And at 13,000 AMD a real bargain!). The Hotel Dina can also provide nice and cheap home-cooked meals (on request) – which is handy, since there is pretty little in the way of alternatives in town other than the usual rough BBQ meat khoravats. Combinability with other dark destinations: The best (if not the only) reason for dark tourists to set up camp in this forlorn little place really is the fact that it is convenient as a stop-over to break the journey between Yerevan and Nagorno-Karabakh. Combinability with non-dark destinations: Sisian doesn't offer much for mainstream tourists – apart from an idiosyncratic house museum and a history museum with a field of ancient khatchkars and ram stones in front of it. In contrast, though, the region it is located in has some outstanding gems on offer, and is at the same time still pretty unspoiled by mass tourism. The closest, and one of the region's most important attractions, is the ancient site of Zorats Karer just a few miles up the hill en route to the main trunk road. The site features stone circles and rows of basalt slabs with holes in them (for some kind of astronomical measurements) and is often referred to as "Armenia's Stonehenge". Size-wise the stones can hardly compete with the world-famous ensemble of the counterpart in Britain. But in stark contrast to the always overcrowded English original you may well find yourself having Zorats Karer all to yourself. Further afield is the monastery complex of Tatev. Getting there requires a hired taxi for the day – which the manager of Hotel Dina arranged for me at an extremely competitive price! Tatev is perched dramatically on a high cliff overlooking a massive canyon. Wow-factor views guaranteed. The monastery itself is also impressive. There are so many Armenian church complexes you'll see on any trip to this country that it can trigger "monastery fatigue" in even the most hardened architectural treasures tourist. But Tatev I found the one that genuinely impressive me the most. Indeed, more so than the much more famous (and hence often crowded) Khor Virap complex on the border with Turkey at the foot of Armenia's "holy mountain" Ararat. Although I admit that the view of that bulky mountain is not easily beaten. En route to Tatev, at the bottom of the valley, there's a site called, evocatively, "Satan's Bridge", but it's not a dark site at all – instead, most people stop here to have a splash in the nearby rock pools!